I did this card today for a color challenge. The challenge was to use Riding Hood Red, Basic Gray, and Always Artichoke. There's very little Artichoke in my card, just the stem and leaves on the rose but the other colors are there! I made this card by first making a mask with acetate using the Big Shot Top Note die. I then used removable adhesive to glue the mask down on top of my shimmery white cardstock. I stamped the rose image in Basic Black and then used the reinkers to color the rose. When it was dry, I masked it. 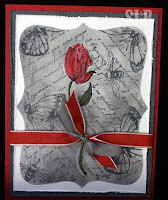 I then stamped the butterflies and bees using Basic Gray. I then covered them up with a mask as well and then stamped the verse stamp also using Basic Gray. After that, I removed the masks from the butterlies and bees and I sponged Going Gray all over the card. (The rose was still masked.) Once I had it sponged the way I liked it, I peeled up the rose mask and added a little color around the rose where the mask had covered too much. (It's hard trimming that stem down to just the right size!) After that I removed the Top Note mask which left the appearance of the Top Note without actually using a Top Note on the card! Then I finished up the card by distressing the edges and adding ribbon. All products from Stampin' Up! This is so cool! I can never get collage-type stuff to turn out right. I think I'm too an@l about positioning the stamp just right. Good job!